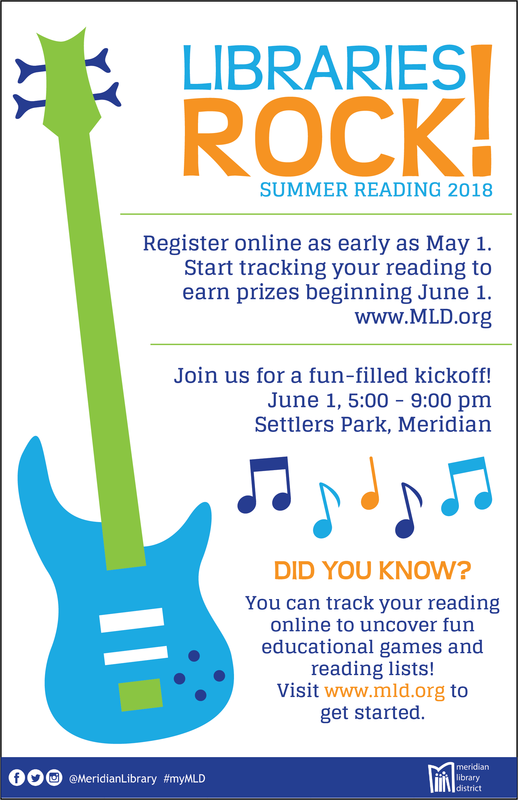 Join us at Settlers Park to kickoff our Summer Reading program. Why: Come sign-up to participate in the Summer Reading program and then check off your first reading goal by reading to the community leaders. There will be food & drink vendors such as Dickey's Barbecue Pit, Dutch Bros. Coffee, Octopie, and Menchie's Frozen Yogurt. Meet the DJ from the River 94.9 radio station! With over 40 organizations from the community there will be a lot of fun activities to explore. Come check out all kinds of technology at the unBound booth, grab a book at the Bookmobile, get your face painted, and play in the bounce houses. It will be a fun-filled evening! Check out our photo album from last year's Kickoff on our Facebook page. Stay for the Movie Night in Meridian to watch Leap!